Take a pan and heat oil. Add grated beetroot and sauté it for about 1-2 minutes. Don’t overcook it. 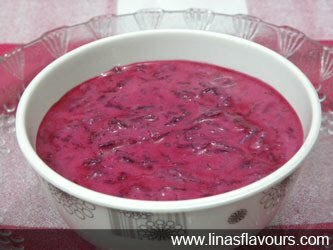 It will slightly soften the beetroot and would not taste it raw while eating. Or you can par boil it slightly. Take a bowl and mix all the above mentioned ingredients. Keep it in the refrigerator to cool it or serve it immediately.